The Global Volcanism Program has no activity reports for Beru. The Global Volcanism Program has no Weekly Reports available for Beru. The Global Volcanism Program has no Bulletin Reports available for Beru. The Global Volcanism Program has no synonyms or subfeatures listed for Beru. An area of Holocene basaltic lava flows is located along the Main Ethiopian Rift at Beru, between Fentale and Kone (Gariboldi) volcanoes. The Global Volcanism Program is not aware of any Holocene eruptions from Beru. If this volcano has had large eruptions (VEI >= 4) prior to 10,000 years ago, information might be found on the Beru page in the LaMEVE (Large Magnitude Explosive Volcanic Eruptions) database, a part of the Volcano Global Risk Identification and Analysis Project (VOGRIPA). There is no Deformation History data available for Beru. There is no Emissions History data available for Beru. 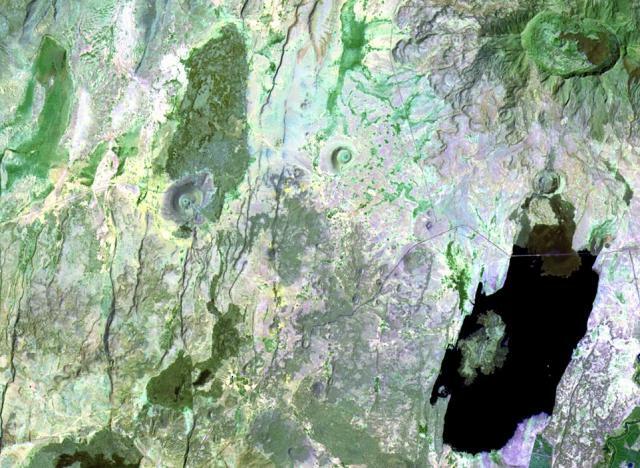 An area of Holocene basaltic pyroclastic cones and lava flows is located along the Main Ethiopian Rift at Beru, between Fentale (upper right) and Kone (Gariboldi) volcanoes (lower left). The lake at the lower right is Metahara, whose northern shore is formed by a young lava flow from a flank vent of Fentale (Fantale) volcano. There are no samples for Beru in the Smithsonian's NMNH Department of Mineral Sciences Rock and Ore collection. Large Eruptions of Beru Information about large Quaternary eruptions (VEI >= 4) is cataloged in the Large Magnitude Explosive Volcanic Eruptions (LaMEVE) database of the Volcano Global Risk Identification and Analysis Project (VOGRIPA).